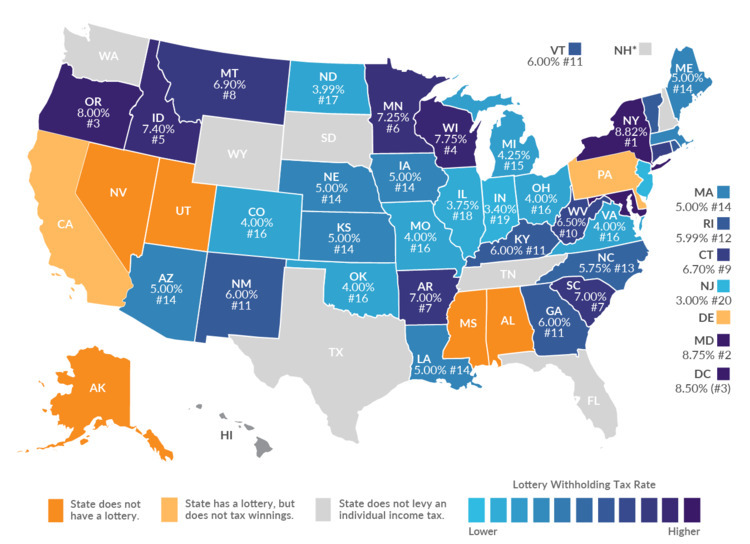 What Are the Taxes on Lottery Winnings in the US? Whether you are reading this before or after a big win, understanding what the US tax on lottery winnings is well worth your while. Since there is a huge tax difference between states and even certain cities, spending a few minutes to grasp a few basics now could ultimately save you a fortune later on. First up, any jackpot winner will only get the full lottery win payout if they opt for the "30 payments over 29 years in annuities" deal. If the winner chooses to have it all in one lump sum, the jackpot amount is immediately cut down. Surprisingly, 98% of lottery winners choose to take their winnings in one lump sum payout—probably because they are too excited to realize the full weight of deductions and taxes. If you select the 30 payments (every participating state has different annuity payment schedules), they actually increase over time to stay in line with inflation. A well-structured annuity can be designed in quite a few ways to pay out the winner over the next 30 years; 2% to 3% interest per annum added to the annuity payouts keeps up with the current pace of inflation and can be guaranteed for 30 years to a beneficiary in case of death. Next in line is the federal tax bill. Your lottery winnings are taxed just as if they were an ordinary income bonus. This means your income will be pushed into the highest federal tax rate, which is 39.6%. There is no way you can work around this—the U.S. government does not give tax breaks to even the luckiest people in the country. With this in mind, the government will immediately and automatically withhold 25% of the lottery jackpot if the winner is a U.S. resident/citizen with a social security number. The remaining 14.6% must be paid in full come the next tax year. This seems a bit unfair when countries such as the United Kingdom and Canada do not regard a lottery win as extra income—it remains tax free until it becomes part of the winner’s estate. What Happens if the Lottery is Won by a Non-Resident? U.S. residents who don’t have a social security number, for one reason or another, have 28% of the big payout withheld, and foreigners have 30% held back by the government. This is to cover the possibility of the tax balance not being honoured when April comes around. While anyone who is visiting the country can buy a ticket, taking it out of the country is technically considered illegal. Luckily, there exist “lottery agents,” which are companies that legally buy tickets for their non-American clients. These online lottery sites are actually the easiest way to play other countries’ lotteries, as they offer many benefits and take care of most of the hassles involved in buying lottery tickets, checking them for wins, and even claiming smaller prizes. For big wins, however, you'd still need to visit the US to claim them yourself. Following hard on the heels of federal taxes come state and local income taxes. If you live in New York City, a quadruple whammy of city, county, state and federal taxes will come due by the next April. This can further reduce your lump sum by another 15%. 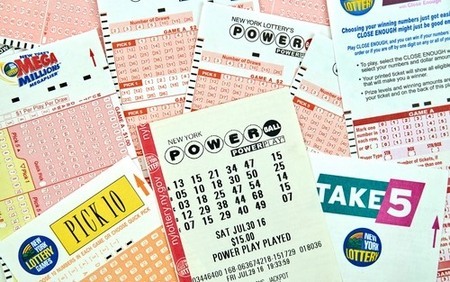 However, if you live in Wyoming, Washington, Texas, Tennessee, South Dakota, New Hampshire or Florida, then you are not taxed on personal income, and Pennsylvania and California benevolently exempt lottery win jackpots from their state income tax if the ticket was purchased in state. Won a big sum and want to gift some or all of it (yeah, right!) to a friend or family member? This is not as straightforward as one might think. A formal agreement has to be made before the numbers have been announced; otherwise, the money given to family or friends is considered a gift and not an income. This means that the tax obligations will fall on the giver and not the recipient. The IRS actually allows you to gift up to $14,000 tax-free per person every year, but bigger amounts will eat away at your $5.45 million lifetime exemption. If you exceed that amount, then the tax will be a flat 40%. At least gifting to a spouse is unlimited! Despite all the tax issues that loom over a lottery win, the excitement of being in the running makes it very worthwhile. The monies generated from ticket sales go towards educational improvements and environmental protection, among other worthy causes, which makes the lottery a true case of “win-win”. If you're feeling lucky (and don't mind sharing some of your winnings with the taxman), here are the best lotteries to play both within the US and far beyond its borders.